This was the 6th Friern Barnet HQ, before that it was 6th East Barnet. They change the groups name when they change the parish boundaries. The group was registered in May 1930. I was a Cub and Sea Scout member of the 6th Friern Barnet Scout Group from 1947 to 1955.
and we all received a Handyman proficiency badge when it was completed. 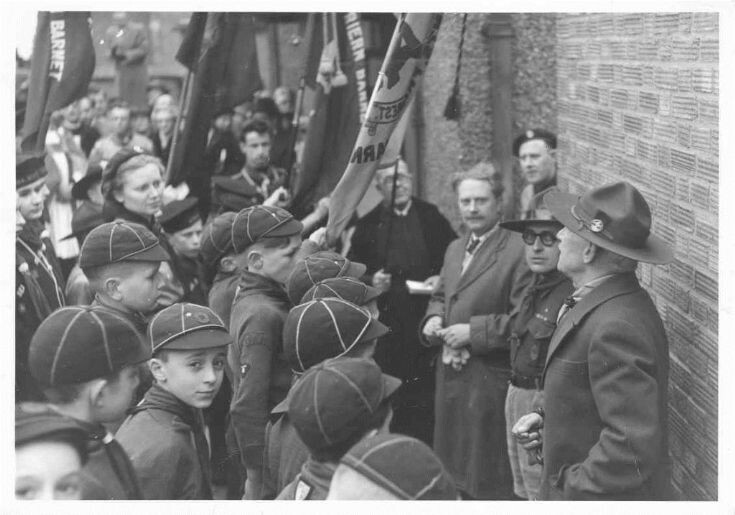 The man to the right of the photo was J Dudley Pank - the District Commissioner. To his right was Barton the Group Scout Leader. Last in the line in a black cassock was Bill Thatcher, the Church Verger. The opening day was on a Sunday after morning service. I was in the Church choir and not in Sea Scout uniform. That my be me top left in cassock and surplice. I'd love to know what happened to the 4th East Barnet Scout Group. Our hut was next to Oakleigh Park railway station. J Dudley Pank passed me on my 1st class hike. Still there, Just building was rebuilt. Group still going strong. Thanks for that, Andy: good to know that the 4th East Barnet is still around. I did my 1st Class Hike with Ian Redhouse in August 1951: train to Hatfield then walked to George Bernard Shaw's house at Ayot St Lawrence ( 15 miles from home, I note . We signed the visitors' book. I wonder what happened to Ian, or any of my other pals in the 4th E B. I'm 82 now so . . .